Tom Corbett, Space Cadet was a major media star in the 1950s. With fellow students Astro and Roger Manning, Corbett was in training at the Space Academy. They were working toward becoming members of the Solar Guard, which protected human beings in the solar system and beyond. Their thrilling adventures appeared in television, radio, books, comic books, comic strips and more. There were Tom Corbett coloring books, costumes, a pocket watch, a Space Academy playset with plastic figures, a lunch box and a View-Master packet. Corbett was even spoofed on several episodes of the popular radio program Bob and Ray. From 1952 through 1954, Dell published eleven issues of Tom Corbett comic books. Prize Comics published three additional issues in 1955. 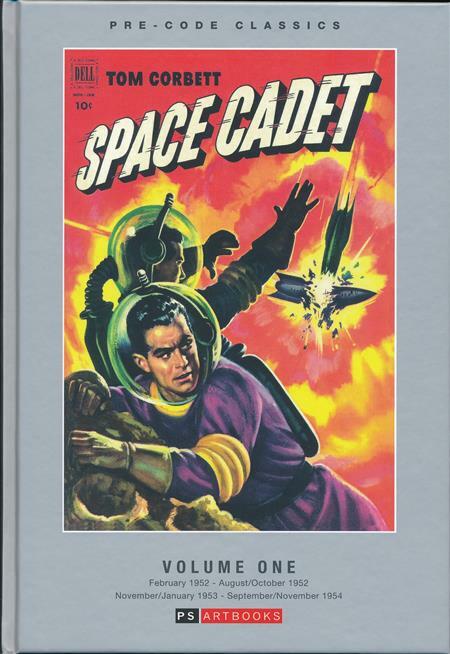 Pre-Code Classics: Tom Corbett, Space Cadet Volumes One and Two [PS Artbooks; $59.99 each] collects all fourteen Tom Corbett comics in two hardcover editions. In merely good condition, the issues would cost you over $175, assuming you could find them. The convenience of having entire runs in one or two volumes is what draws me back to PS’s offerings again and again. The Dell issues are superior to the Prize issues, largely because the stories run over 30 pages. Even an average story benefits from that kind of breathing space and original comics writer Paul Newman wrote above-average stories. Joe Greene, who followed Newman on the Dell series, did a fine job as well. While the art on these issues isn’t breathtaking, John Lehti, Alden McWilliams and Frank Thorne were all terrific storytellers who knew how to keep a story moving in an interesting way. The Prize issues don’t measure up to the Dell ones. Instead of one long story, each issue has three Tom Corbett adventures of seven to eight pages each, a two-page “Captain Quick and the Space Scouts” tale and assorted filler pages. Of the latter, I got a kick out of the “Space News” text pages, which featured several short items on space science and related subjects. By the Prize series, Roger Manning, who was a boastful, impulsive, yet still fairly competent and occasionally heroic cadet, was gone from the series and replaced by the simply bumbling T.J. Thistle. Even though Greene wrote a couple of stories for the Prize issues, the stories didn’t have the range of the Dell adventures. Indeed, the new comics often came off as little more than police in space tales. Even artist Mort Meskin couldn’t elevate them above merely adequate. Though the above may seem like I’m condemning these hardcovers with faint praise, I have no regrets about purchasing them. I wouldn’t have read these comics if PS hadn’t collected them. With a discount from InStock Trades, who sponsor this weekly column, I got both of them for under a hundred bucks combined. That’s a reasonable price to pay to scratch my itch to learn more about the comics published in the 1950s. If you’re also interested in the comics of the 1950s or in Tom Corbett, Space Cadet, I think you’ll enjoy these volumes as much as I did. 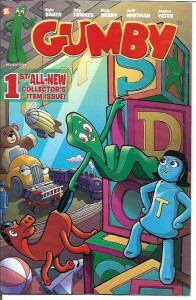 While I was visiting New York recently, Papercutz editor-in-chief Jim Salicrup gave me a copy of Gumby Vol. 4 #1 [$3.99], the latest comics series based on the beloved character created by Art Clokey. The issue features three comics stories totaling 25 pages and three additional pages of text-and-photo features. Oh, yeah, and it has a cover by the great Rick Geary. I have never been a huge Gumby fan, but I recall watching many of the cartoons as a kid and always enjoying them. The three stories in this issue remind me of those simpler times. Jeff Whitman’s “An Alien Abundance” is actually a sequel of sorts to the very first Gumby cartoon. Drawn by Joylon Yates, an artist whose work I’ve praised in the past, the tale goes to the moon and back. It’s a fun adventure, suitable for all ages, including older readers like myself. Kyle Baker’s “Model-y Crew” introduces fashion doll Maddie. It’s an odd sort of Cinderella story with Gumby and Pokey attempting to get their new friend ready for an event while a dastardly “Blockhead” works against them. Finally, Ray Fawkes with artist Yates relates the chilling thriller of “Gumby and Pokey in the Land of Ice Cream.” More good-natured giggles for one and all. If you’re a Gumby fan, a reader with varied tastes or a parent in search of good comics for young readers, Papercutz delivers on all three counts with this premiere issue. Give it a look. My top pick of the week is Buffy the Vampire Slayer Season 11 #1-7 [Dark Horse; $3.99 per issue] by Christos Gage and Rebekah Isaacs. Warning. There will be SPOILERS AHEAD, the better to tell you why I love this new season so much. This new season picks up where the previous season left off. Buffy and her cast seem to be happy and living in San Francisco. That’s when a dragon pretty much destroys the city. Government forces use this attack as an excuse to crack down on all supernatural beings. Before long, supernatural creatures are being relocated to camps. This is put forth as a “temporary” measure to give the government time to find a better solution to the problem, a solution that will work for all concerned. Oh, yeah, I completely believe they want what’s best for everyone. That’s the END OF THE SPOILERS. Now come the reasons I choose this series as my pick of the week. This story terrifies me. Being published at a time when we have a president who refuses to stand against neo-Nazis, the KKK and other white nationalists…at a time when civil rights violations are on the rise…at a time when the ruling party works to disenfranchise voters who don’t support them…this story terrifies me in a “Good Lord! This actually could happen here!” way. Add that to watching beloved characters and even new characters go through indignities and injury at the hands of arrogant government thugs. My heart sinks at least once an issue as I follow this soul-crushing, albeit brilliant, story line. Buffy the Vampire Slayer has always been at its best when speaking to real-world issues, even metaphorically. We’ve followed Buffy and the Scooby Gang through the horror of high school, relationships, the passing of loved ones and more. With this story, Buffy becomes again one of the most relevant of heroic sagas. Currently available in trade paperback is Buffy Season 11 Volume 1: The Spread of Their Evil [$19.99], which collects the first six issues. Coming next February is Buffy Season 11 Volume 2: One Girl in All the World [$19.99], which features the remaining issues in this season. If you love Buffy, you’ll love this new series. If you like heroic fiction with a real-world edge, this story will hook you but good. If you’ve been reading my reviews long enough to trust me whenever I recommend something, you’ll seek out this series. 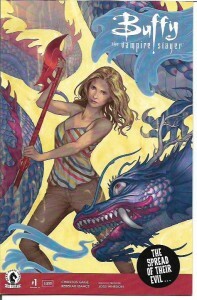 It ranks among the best Buffy comics that have ever been done. Thanks for spending some time with me. I’ll be back next week with more reviews.